Dr. Maggie Atkinson the Children’s Commissioner for England, visited the Axis Educational Trust to speak in front of an audience of teachers, academics, and educationalists about her work in Children’s Rights and the newly report about safeguarding in schools entitled ‘You Have Someone to Trust”. The talk began by referencing some very recent cases from the national news which have raised awareness of the importance of safeguarding children, namely the Megan Stammers case and the abduction of April Jones. These tragic cases highlighted the fact that safeguarding children is the responsibility of society and community: both of these events could have been prevented had adults acted responsibly. Dr. Atkinson then outlined the findings of the ‘You Have Someone to Trust’ report commissioned by the NSPCC and Youth Works. The study examined twenty very different primary schools in a variety of places in the UK which all had outstanding records of safeguarding good practice. Despite their differing contexts, the schools all had very similar safeguarding practices. Following Dr. Atkinson’s speech, there was a wide-ranging discussion of differing safeguarding practices, both good and bad, in schools across London and the UK. The Axis Roundtable event was a great success with all participants leaving with a greater understanding of safeguarding best practice and with a variety of evidence-based and anecdotal information about how safeguarding is crucial both in school and in general life. 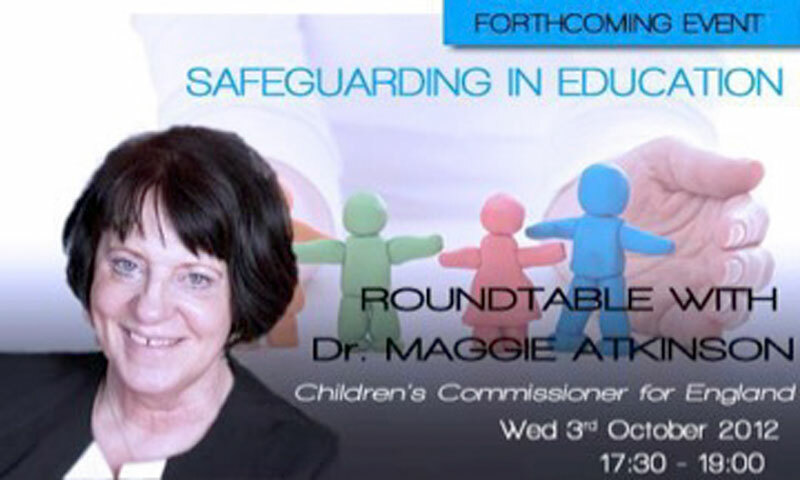 Maggie Atkinson has been Children’s Commissioner for England since March 2010. She has a 30 year career working with and in the interests of children and young people. The Children’s Commissioner began her career teaching English and taught in a range of schools from inner cities to shire counties for 11 years. Before taking up the post, she was Director of Children’s Services in Gateshead. This involved leading staff in various professions and disciplines, as well as 88 partner schools. She also headed revenue budgets for all council services for children and young people. On the national stage, Maggie has been President of the Association of Directors of Children’s Services, Chair of the multi-agency Centre for Excellent in Outcomes and Chair of the Children and Young People’s Workforce National Partnership which included skills councils, unions, third sector stakeholders and public bodies. In addition, Maggie Atkinson held a range of positions in local government including County Manager (Education Standards) at Cheshire County Council, Assistant Director (Quality Assurance) at Warrington Council, Ofsted Inspector at Kirklees MBC, and Advisor, Schools Management Support at Birmingham City Council.